"We do not have a drop of gas. "Sighs Rafael Maldonado, a pump attendant in a downtown area of ​​Mexico City. A few blocks away, huge lines of cars are formed in front of the service stations still open, causing traffic jams monsters. The new Mexican president, Andres Manuel Lopez Obrador, called, Thursday, January 10, "To the collaboration and understanding of all citizens", facing the shortage caused by its shock offensive against organized crime fuel theft. At the wheel of his car, Jose Antonio Garcia gets upset. "It's been two hours I'm waiting to refuel ", this 50-year-old taxi driver gets caught up in a horn concert. A quarter of Mexico's petrol stations are closed, according to the city council of the megacity where circulate nearly 5 million cars per day. A situation caused by the locking of several pipelines to prevent their mafia siphoning on a large scale. The government is using tanker trucks that are struggling to supply the entire country. "There is no shortage, but a distribution problem"repeated, on Thursday, Mr. Lopez Obrador, nicknamed "AMLO" (his initials), who took office on 1st December 2018. The president also announced the sabotage, Wednesday, January 9, of a pipeline that feeds Mexico, aggravating the growing shortcomings, affecting, since Tuesday, January 8, eight other states in central and western Mexico. At the top, that of Jalisco, where only half of daily fuel consumption is assured in Guadalajara, the second largest city in the country (4 million inhabitants). "It is irresponsible to have ordered the closure of pipelines without having planned the necessary measures", said Alejandro Guzman, Jalisco's economic development officer. 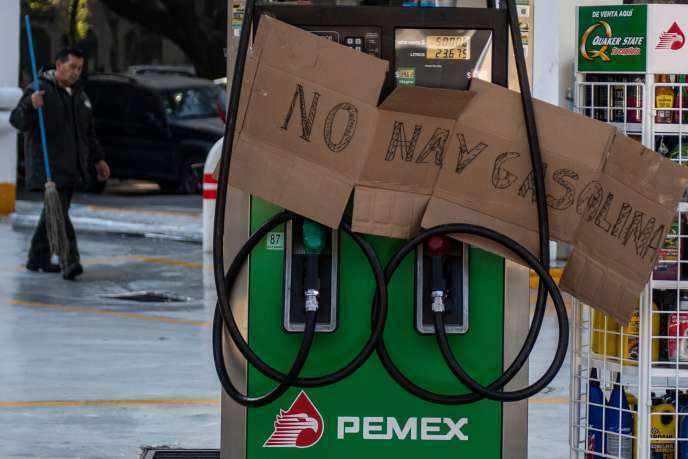 These supply problems are the consequence of the plan launched on 20 December 2018 by AMLO to eradicate fuel theft, which cost 600 billion pesos (2.7 billion euros) to Pemex, the state oil company. "That's between 6% and 7% of national consumption"says Fluvio Ruiz, a former Pemex advisor, from 2009 to 2014. Some 4,000 troops were deployed in early January to reinforce the control of 58 Pemex facilities, including six refineries, and oversight of tank truck convoys. Not to mention the inspection and closure of some oil pipelines, where flights have been reported.